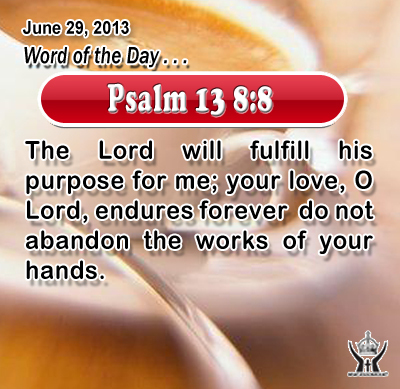 Psalm 138:8The Lord will fulfill his purpose for me; your love, O Lord, endures forever do not abandon the works of your hands. Heavenly Father, please use all of your power and grace to bring our loved ones and dear friends to repentance so that when Jesus appears they can share in our joy and your salvation. In the name of Infant Jesus we pray. Amen. 13Now when Jesus came into the district of Caesare'a Philip'pi, he asked his disciples, "Who do men say that the Son of man is?" 14 And they said, "Some say John the Baptist, others say Eli'jah, and others Jeremiah or one of the prophets." 15 He said to them, "But who do you say that I am?" 16 Simon Peter replied, "You are the Christ, the Son of the living God." 17 And Jesus answered him, "Blessed are you, Simon Bar-Jona! For flesh and blood has not revealed this to you, but my Father who is in heaven. 18 And I tell you, you are Peter, and on this rock I will build my church, and the powers of death shall not prevail against it. 19 I will give you the keys of the kingdom of heaven, and whatever you bind on earth shall be bound in heaven, and whatever you loose on earth shall be loosed in heaven." Jesus tested his disciples with a critical question: Who do men say that I am and who do you say that I am? Jesus was recognized in Israel as a mighty man of God, even being compared with the most of the prophets, John the Baptist, Elijah, and Jeremiah. Peter, always quickly to respond, cry out that Jesus was the Christ, the Son of the living God. Through the gift of faith Peter acknowledged that Jesus was the "anointed one", and the only begotten Son of God sent by the Father in heaven to redeem a fallen human race. No mortal being could have revealed this to Peter; but only God. Jesus then conferred on Peter power to govern the church that Jesus would build, a church that no powers could overcome. Jesus played on Peter's name which is the same word for "rock" in both Aramaic and Greek. To call someone a "rock" is one of the most of compliments. The rabbis had a saying that when God saw Abraham, he exclaimed: "I have discovered a rock to found the world upon." Abraham put his trust in God and made God's word the base of his life and the bedrock of his faith. Through Abraham God established a nation for himself. Through faith Peter grasped who Jesus truly was. He was the first apostle to announce that Jesus was truly the Anointed One and the only beloved Son of God.